"Overtraining, fatigue, and burnout are a state of mind. Certainly, we all get tired after putting in miles of laps, but the notion of burnout is really a psychological one." 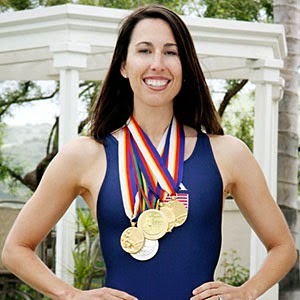 During my swimming career, I took the above sentiment to heart. More was always better -- more pool sessions per week, more laps, more dryland training. I even went so far as to perform 1000 "abs" per day for a while, as per Evans' recommendation. As it turns out, I'm not Janet Evans, and neither are you, probably. (Unless you are, in which case, thanks for reading, Janet!) Looking back, I was always in my best shape at the very beginning of the college season, after having trained more moderately during the summer. By mid-season, I was exhibiting numerous signs of overtraining, like constant lethargy, decreased performance in competition, and low motivation to train. A week or two of strategic overreaching (an abrupt and generous increase in training volume) and subsequent supercompensation through a deload (an abrupt reduction in training volume) or complete rest is one thing. But training past exhaustion day after day, week after week, is simply counterproductive and a recipe for overtraining. The knock here isn't on Evans, of course. Her training methods obviously worked for her. Some genetically-gifted individuals will be able to train twice a day, every day, no problem. Most mere mortals, however, will not. The key is to find your unique sweet spot in terms of training frequency. In my model below, "Preparedness to Train" is an overall measure of how ready you are for your next bout of exercise. It takes into account the muscular, neurological, and psychological stress that a workout imposes on the body. Immediately after a workout ("Training Stimulus" above), your body is ill-equipped for a subsequent one -- even if it may not acutely feel like it. If you were to do the same workout again the next day, instead of improving your fitness, you'd actually sink yourself deeper into the recovery hole (pictured below). Too many consecutive weeks of training this way, and you wind up overtrained. Conversely, wait too long to train again, and you end up back where you started (i.e., undertraining after Day 5, above). There exists a sweet spot somewhere in between these extremes, of course. The sweet spot will be unique for everyone, but the idea is that if you wait a day or two before returning to training, you'll be able to piggyback off your initial gains, resulting in even greater gains. It would seem, according to this model, that for maximal gains there is room for only two training sessions per week. The workaround for this is actually split training, or the targeting of different movements over the course of the week. For instance, on Days 1 and 4, your primary lifts might be a hip dominant lower body exercise (deadlifts) and an upper body push (bench or overhead press). Days 2 and 5, then, would be knee dominant (squats) and upper body pulling (pull-ups or rows). Previous training sessions will always impact subsequent ones, but split training will limit that interference. 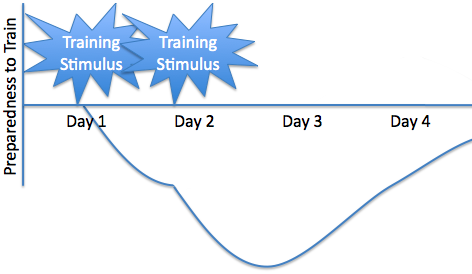 The exact shape of the "Preparedness to Train" curve will vary depending on a variety of factors including simple genetics, the intensity of the training stimulus, the individual's level of conditioning, and the recovery strategies employed. The good news, if you love to train, is that the better shape you get in, the more frequently you're able to do so. If you have any doubts whatsoever about your deadlifting, pressing, squatting, pull-up, or rowing technique, be sure to grab your free copy of my new e-book, The Big Six Made Simple: A Guide to the Basic Barbell Lifts. All you have to do is enter your e-mail address at the top of this page to subscribe to my newsletter, and you'll receive a link to download The Big Six Made Simple immediately.